The Deku Baba made its original debut as the first enemy you encountered in Ocarina of Time. In that game, they appeared in two varieties: a type that would passively stand erect, and that left behind Deku Sticks upon defeat, and another more aggressive species that breathed poison gas and dropped Deku Nuts. They were pretty simple enemies that you could take down with a couple easy swings from your sword. Stunning them with Deku Nuts made the task even easier, especially against the violent ones. Babas returned in Majora’s Mask, along with a miniature form called the Mini-Baba and an entirely new variety known as the Bio Deku Baba. Once these Babas’ stems were cut, they would run around on makeshift legs and make moves against Link. The Wind Waker introduced an ocean-bound version of the Deku Baba known as the Boko Baba, which you fought in an almost identical fashion to the standards Babas of previous games. They left behind Boko Sticks and Boko Baba Buds that you could make use of for lighting torches and brewing potions, respectively. Twilight Princess brought back the standard Deku Babas along with a slew of other newer versions such as the Baba Serpent, Big Deku Baba, as well as the supreme Diababa, boss of the Forest Temple. There were also shadowy incarnations of the Babas in the Twilight Realm. This renewed popularity of the Baba resulted in its first-ever handheld appearance via the Fire Baba of Spirit Tracks. 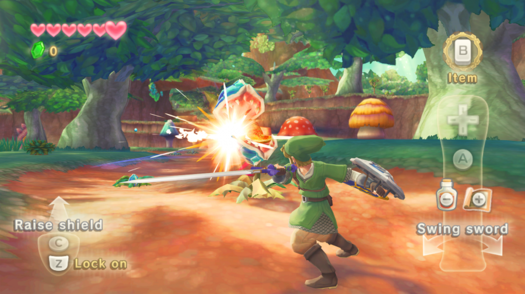 Now, Deku Babas are set to make another encore appearance in Skyward Sword. You’ll fight them somewhat differently this time around: instead of slicing through their stems, you have to cut their open mouths. The direction in which the Babas’ mouths are open – vertically or horizontally – influences the direction you need to swing your sword. You have to cut straight across the mouth, as hitting the outer shell will bring your slice to a dead stop. 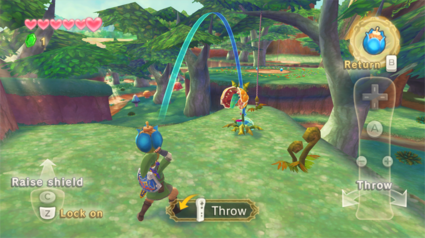 With the new strategic element in play, made possible by the Wii Motion Plus, Babas will likely be more difficult in Skyward Sword than in any Zelda before it. There’s also an even more difficult variety: the Gold Deku Baba. You defeat this one in just the same way, but it’ll change the direction of its mouth at intervals to keep you guessing. It also takes more hits to defeat, and thus more diligence on your part. And a little known fact about Babas – you can toss Bombs into their mouths! They’ll try to scoop them up, oblivious to the Bombs’ explosive qualities. It makes for an alternate way to take them down, and one that might arguably be more satisfying. 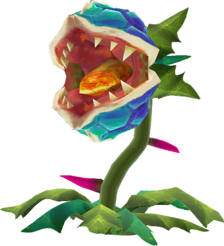 In the end, though, while Babas certainly aren’t the enemy we’re most excited about, the amount of attention Nintendo’s given them this time around is definitely something that we’d like to see for the other enemies we’ll encounter in Skyward Sword.